Suffice it to say collectors have not been thrilled with many of the recent commemorative coin designs being supplied by the United States Mint. 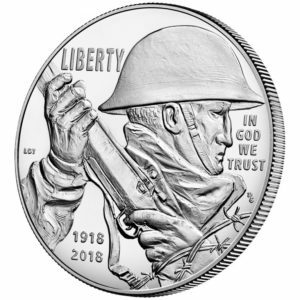 Early indications are that next year's 2018 World War I commemorative silver dollars are also garnering less than enthusiastic reviews. While all artistic tastes are subjective, it's worth exploring what the numismatic community is saying detracts from the design—and, on the other hand, what qualities might be considered redeeming. First off, the occasion for the new commemoratives is sound. 2018 marks the 100th anniversary (centennial) of the November 11th armistice that brought WWI to an end. I've heard some comments about how this homage should've been done 25 or 50 years ago, but there's no anniversary quite like a centennial. You'll find no argument about timing from me. The main criticisms of the design appear to follow two lines of thought: some oppose the design because they believe it is uninspired, and others oppose it because of certain visual inaccuracies. This second point is especially important to numismatists and collectors, as having an eye for close attention to detail is basically the "name of the game" when it comes to coins. Apparently, the rifle depicted in the obverse design (pictured, right) could be considered anachronistic, not matching the type used at the time of the war. The placement of the soldier's hands on the gun is also a bit jarring, leaving negative space in the design where part of his torso should be. In terms of lack of inspiration, some have voiced concern that the barbed wire motif has been overused. It appears on both sides of the design and has been used in the past. However, given that the used of barbed wire was first widespread in WWI, it seems a fitting element to emphasize. Others have charged that the image of the soldier boring and "stone-like." Again, this comes down to a matter of taste, but I would say that such a stoic mood is exactly what the artist intended. It fits the somber subject matter—world war—being depicted. 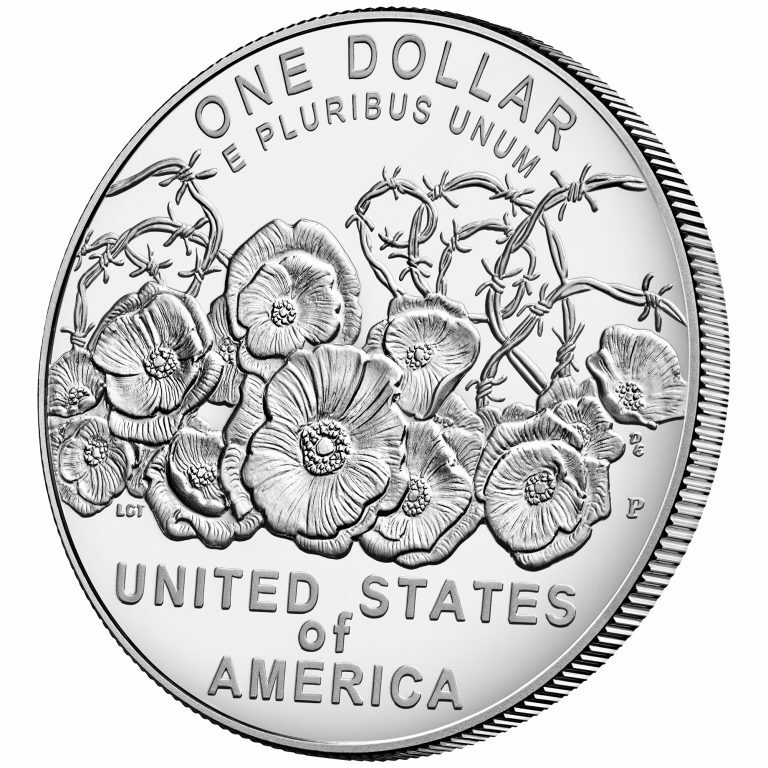 The soldier on the obverse, as well as the poppy flowers interlaced with barbed wire on the reverse, were designed by contest winner LeRoy Transfield from Utah. 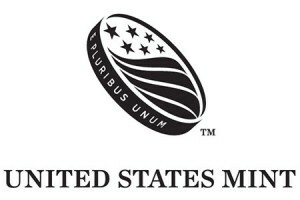 It was the then executed by former U.S. Mint Sculptor-Engraver Don Everhart. If you look closely at the example of the reverse design below, you can see both of their initials just beneath the poppies. The barbed wire and poppies are two of the best-remembered symbols from the "War to End All Wars." The mintage limit for the silver dollars is 350,000 coins. They are each 90% pure silver, using the classic standard for U.S. silver dollars up until 1964. As with other commemorative coin programs, a portion of all proceeds ($10 per coin sold, in this case) will be paid to the sponsoring organization related to the theme of the design. This issue's sales will benefit the United States Foundation for the Commemoration of the World Wars, which plans to use the funds to assist the World War I Centennial Commission. The commemoratives not only honor a noble cause, but also help provide extra money for one. Nonetheless, much of the early responses to the press release about the coin design have been underwhelming. (A quick scan of the comments on Mint News Blog reveals as much.) Yet other collectors have pointed out that the image may be far more impressive once seen in actual relief rather than two-dimensional renderings. Somewhat complicating the issue is the fact that the five accompanying silver medals that celebrate each of the branches of the military (Army, Navy, Marines, Coast Guard, and Air Force) will be sold individually, not as a complete set. From my point of view, there may be an explanation for why the U.S. Mint takes less risks with its coin designs than some other state mints: it must project a stable and uniform image on our money because the U.S. dollar is the world's reserve currency. This probably leads the mint to favor consistency and conservative artwork over more ambitious designs, such as the colorized designs, uniquely shaped coins, and other enticing artistic devices seen from other mints. You can find out more about this WWI centennial commemorative silver dollar and the five silver medals from Coin World or by following one of the links above to the United States Mint.